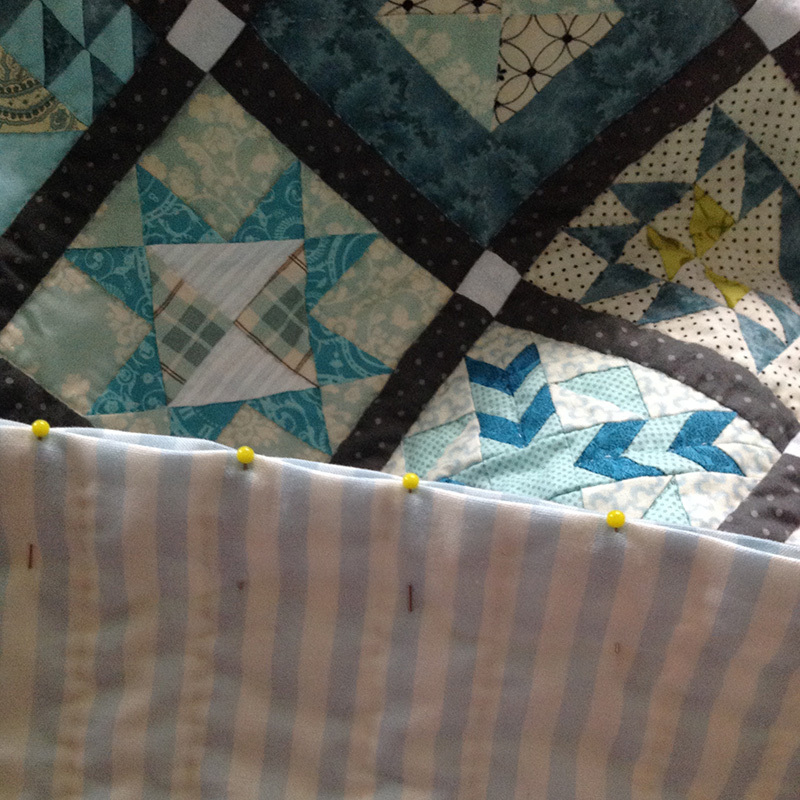 Finally, I have some small news concerning my farmer’s wife quilt. 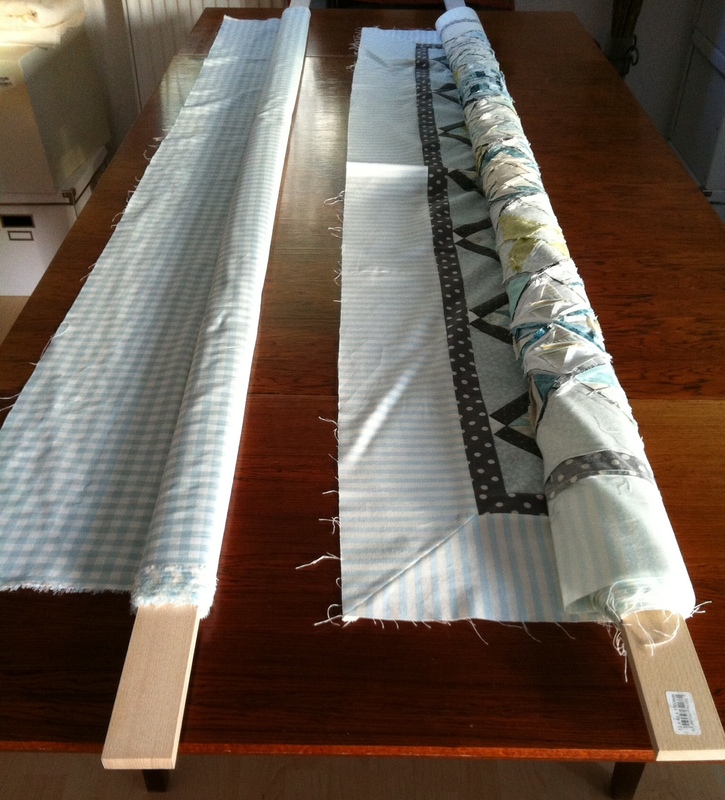 This morning, I went to the quilt store in order to pick the fabric for the sashing and the setting triangles. I still had not made up my mind what colour it would be. All I new was that the cornerstones should be white. 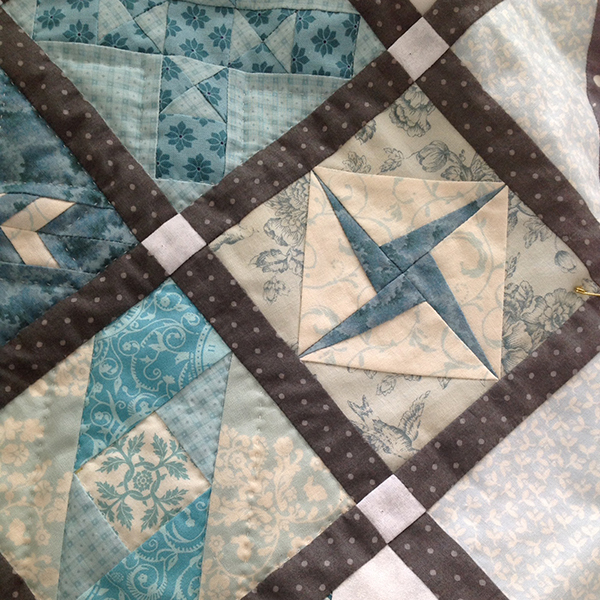 I “sewed” a virtual quilt top on my PC some time ago with the original photos of my blocks. 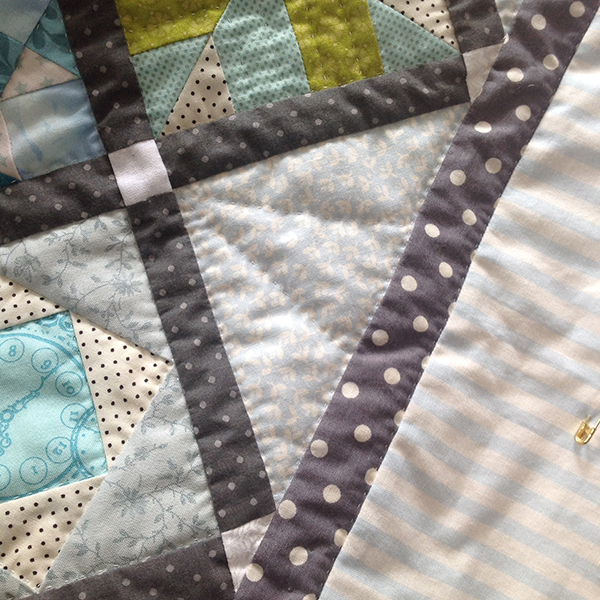 Strangely enough, the quilt looked best when using a black sashing. But I did not want a black sashing! In the quilt store, I was in luck twice. 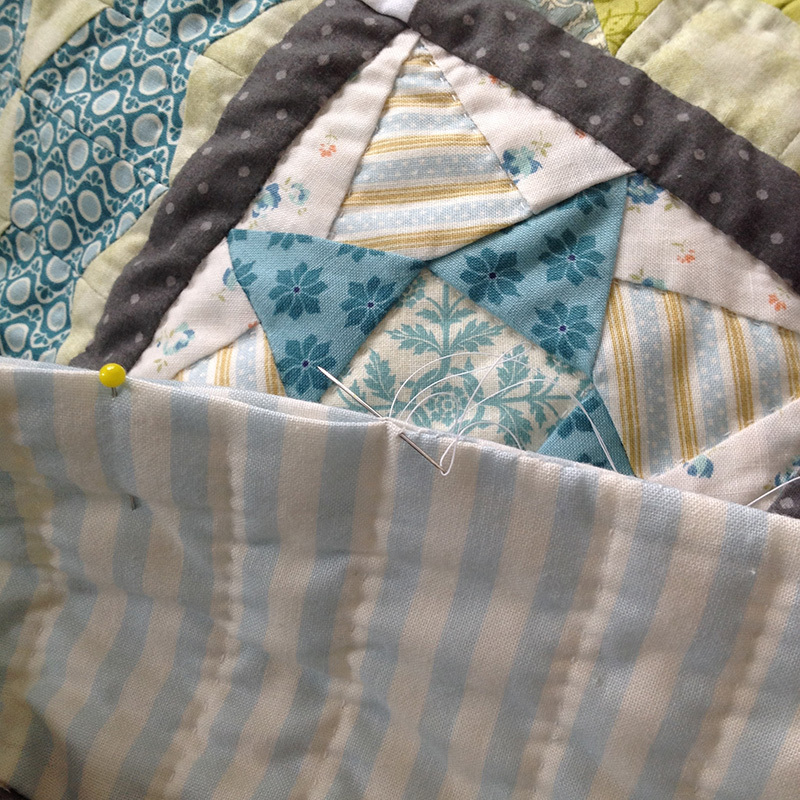 First, the shop owner—a very experienced quilter with a taste not too far from my own—was in herself and offered to assist in the fabric choice. 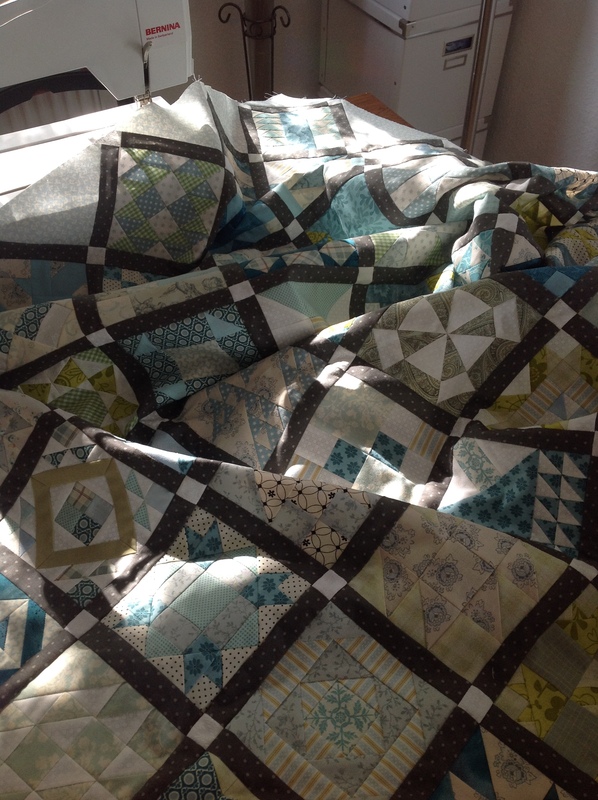 I told her of my virtual quilt and showed her a black print which I had just pulled from one of the shelves. We laid some of my blocks out on it and agreed that it went well. 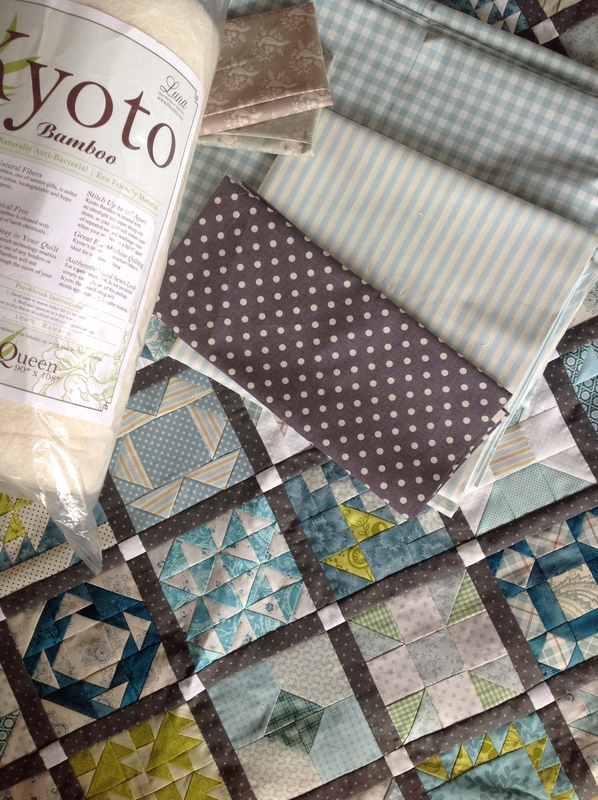 Then she handed me a dotted grey print—not a cold blue-gray which I would have chosen, but a warm brown-grey—and it looked wonderful against my turquoise blocks. She said that brown always goes well with turquoise which astonished me. 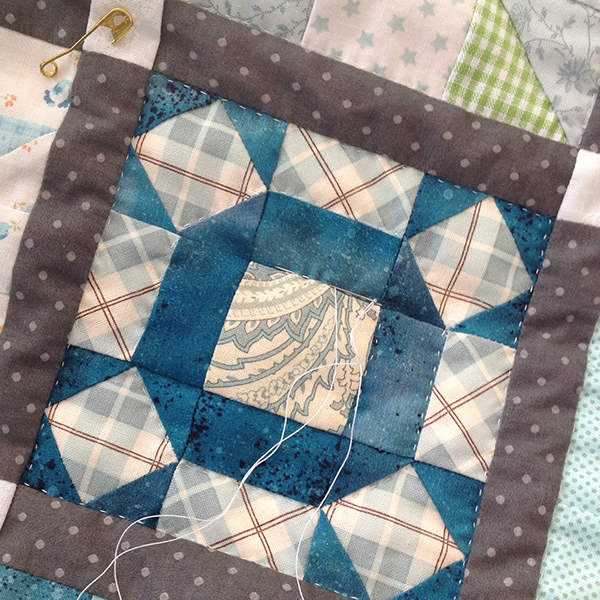 She then found a true brown print and spread some of my blocks on it. I tell you the truth, it looked really really good. Amazing! While she attended another customer, she advised me to go and look out for similar options. Now I browsed the shelves for all kinds of greys and browns and found out that a dark blue print would work as well. 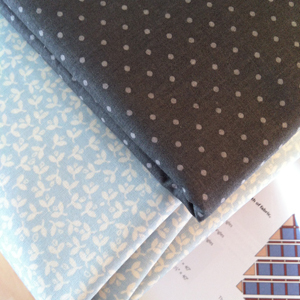 Finally, I opted for the dotted grey print which will give my farmer’s wife quilt just the final touch of colour it needs. And I am still astonished that it matched better than any other colour—even better than some grey/turquoise prints. 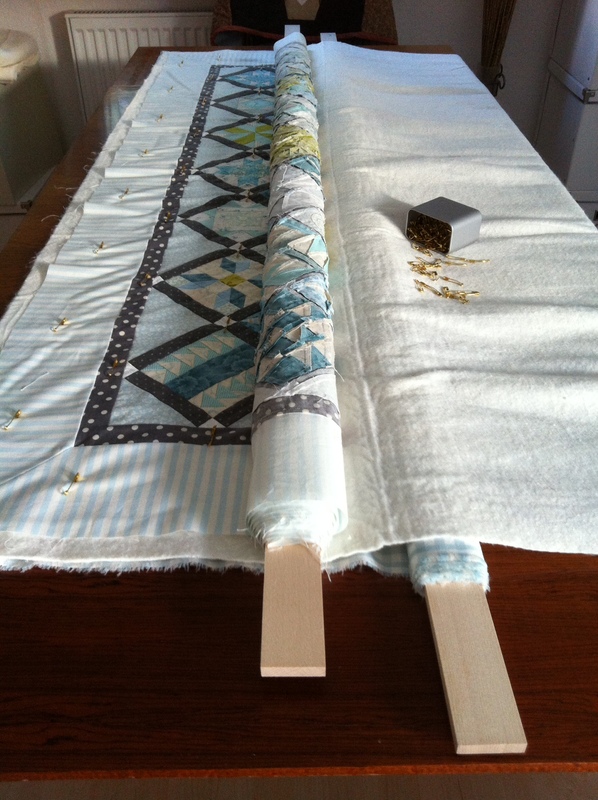 The turquoise/white print for the setting triangles, I found by myself, but she confirmed my choice heartily. And when paying, I learned about my second point of luck when she told me that this grey fabric had just recently arrived and I was the first to buy a piece of the bolt. 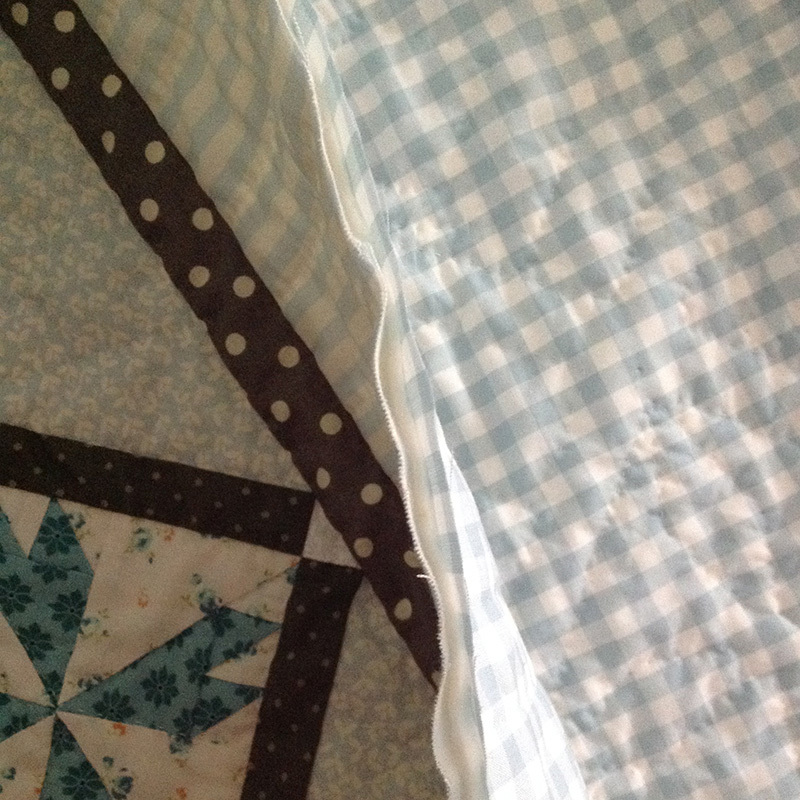 Posted in Uncategorized and tagged fabric choice, farmer's wife, farmer’s wife quilt, quilt. Bookmark the permalink. Wow! I arrived at block no. 1, meaning block no. 111 for me. Unfathomable! Here again, I used one of my favourite prints for the large pieces, as I just did in Autumn Tints. 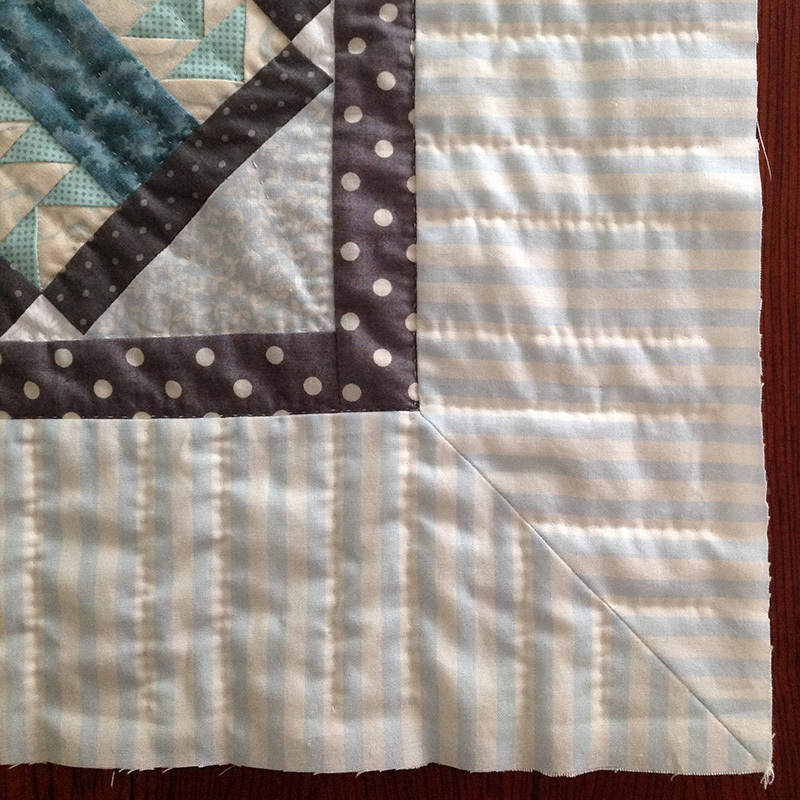 Plus, on this last block I got another opportunity to wholly paper piece a block. I only did this with three other blocks: Economy, Kitchen Woodbox, and Gentleman’s Fancy. And I like all four of them very well indeed. Not for the accuracy only, but for the design as well. This is a happy and a sad day. 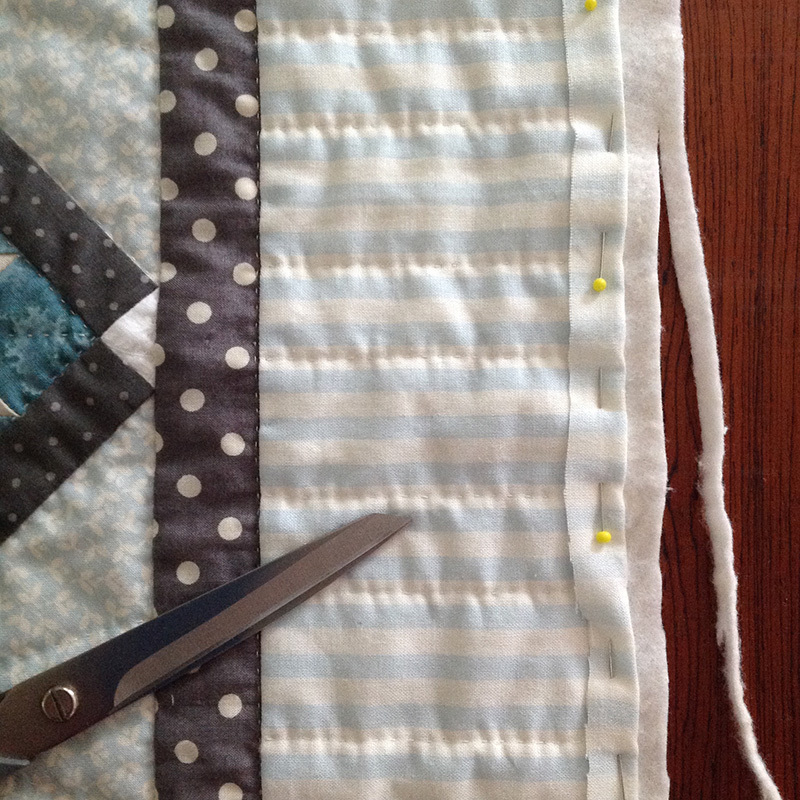 Having finished the 111th block means that there are no more left to be done. Yet, I would be delighted to sew 111 more. 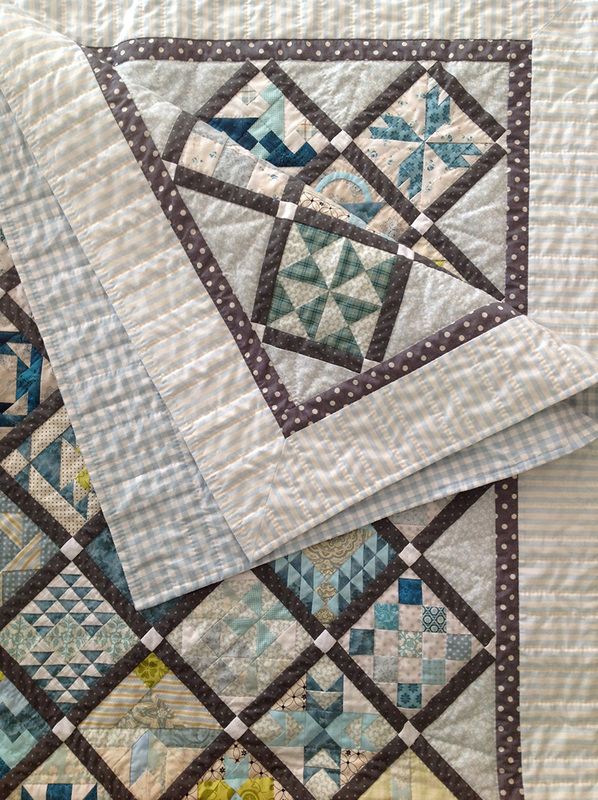 It was so diverting to make these blocks—each with a different claim to choice of fabric, colour combination, and method. Challenging and rewarding at the same time. Posted in Uncategorized and tagged attic windows, attic windows block, farmer's wife, farmer’s wife quilt, quilt, quilt block. Bookmark the permalink. With no autumn colours in my colour range for this sampler, I put all stress on the choice of prints and the direction of the designs. 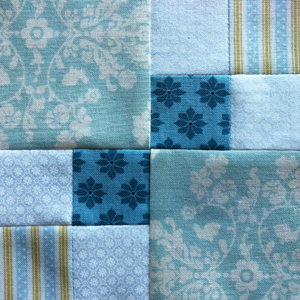 It was fun and easy with such a simple pattern consisting of two different sized squares only. In the two big squares, I wanted to show off some of my favourite print which I wasn’t able to use very often in this sampler due to the small pieces so frequently needed. But now I am very happy to have the opportunity to use it once more. And of course, I did not paper piece this one. It went together with my eyes closed—almost! Posted in Uncategorized and tagged autumn tints, autumn tints block, farmer's wife, farmer’s wife quilt, quilt, quilt block. Bookmark the permalink. 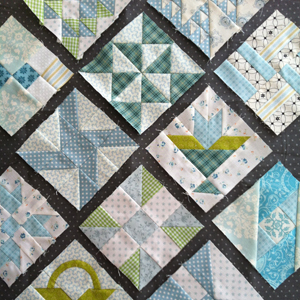 This is the basket block I like best in the farmer’s wife sampler. 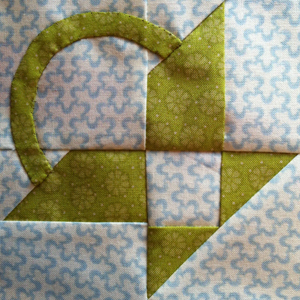 With the benefit of hindsight, I might have liked to use a different green print for the centre square of the basket. 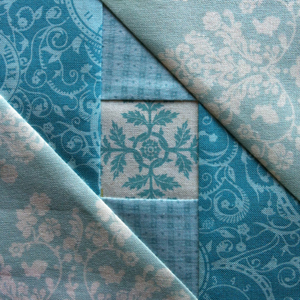 But otherwise, it is a very pretty block. Another very similar basket block was Flower Basket, the more commonly known basket block types were Grape Basket and Fruit Basket, and yet another one was Strawberry Basket. 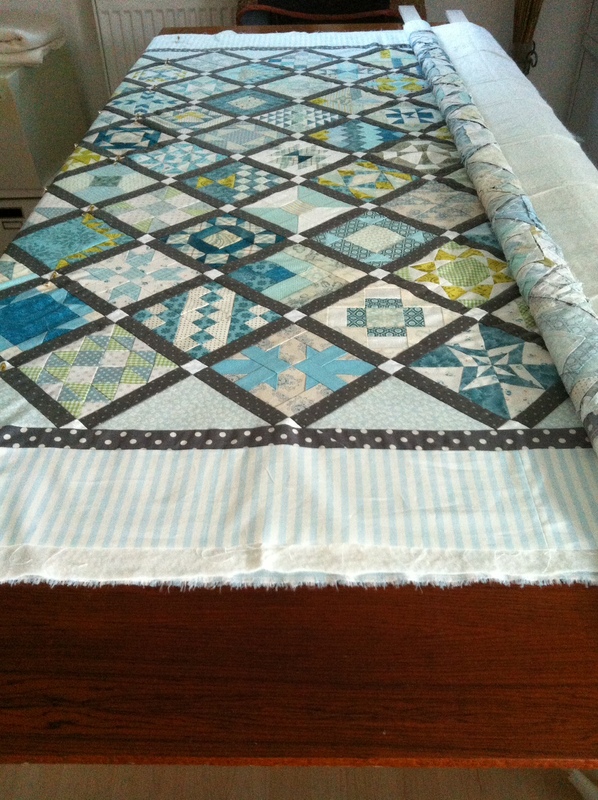 Posted in Uncategorized and tagged basket, basket block, farmer's wife, farmer’s wife quilt, quilt, quilt block. Bookmark the permalink.